The 316L stainless steel case is strong, corrosion resistant material also known as “surgical stainless” steel. The case is milled from a solid block of stainless steel on CNC 5 way axis milling machines, a process normally utilized on watches costing thousands of dollars. The milling processes is not utilized on watches at this price point, instead, they are usually stamped or “cold forged.” This milling process enables us to achieve very high levels of precision. The Revolution “Diver” watch case is designed to withstand 300 meters of static pressure, much deeper than you will ever go…hopefully. The crystal assembly has been designed in a “compressor case” style, where the crystal is compressed into a rubber O-Ring. What this means is the watch itself becomes more water resistant, the more pressure is exerted on it at depth. Case backs are deep laser etched and individually numbered. Each watch is shock protected, utilizing a robust movement holder and wave spring to take anything that comes at it. Finish that off with a professionally applied, brushed finish all around and you have the ultimate beach to boardroom watch. The crystal, or what you look at the watch dial through, needs to be transparent without distorting the information when you need to take a quick glance at the time. Optics, shape and clarity all come into play, which is why we custom designed our own crystal with the finest lab created sapphire material available. The custom-ground dome shaped crystal allows ultimate visibility underwater, as opposed to flat crystals which become highly reflective, almost turning into a mirror image of the water’s surface. Our lab created sapphire won’t scratch, unless you introduce it to the cutting edge of a diamond. Your Revolution “Diver” crystal will look as good 20 years from now, just like new. One more very important feature that assures legibility in extreme conditions is our application of anti reflective material, which absorbs extraneous, refractive light between the crystal and dial, enhancing legibility in extreme conditions. Some companies apply this to the outside, creating scars and divots after usage…but not the Revolution “Diver”; we applied it to the inside, having the same effect but without the degradation of an outside coating. Our diver incorporates a screw down crown, with double gaskets and guaranteed water resistance to 300 meters static pressure. Crown designed with coin edge, milled edge for better grip and signed with our logo. 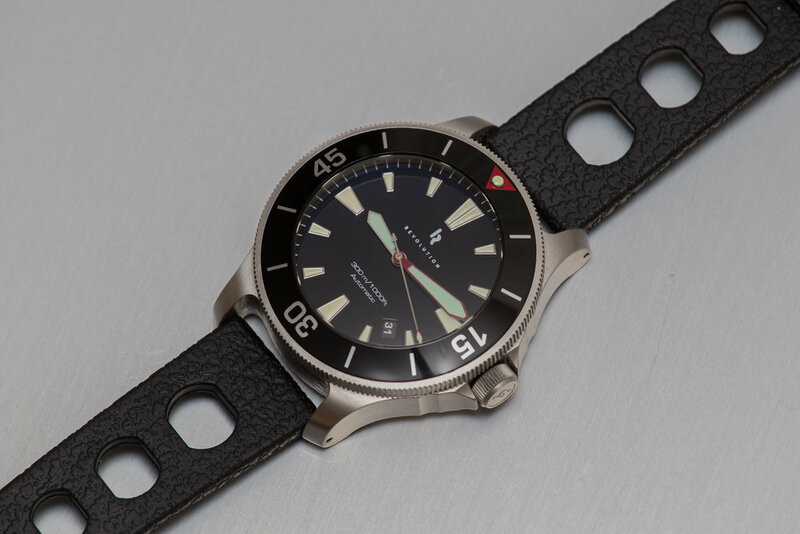 The Revolution “Diver” utilizes a finely machined coin edge milled bezel, inspired by vintage dive watches of the 1970’s that exhibited finely machined “teeth” with maximum grip for a strong, reassuring feel during the deepest of dives. A 120-click ratcheting bezel allows you to time the parking meter or your next dive in the Maldives. The bezel moves counter clockwise, enabling fine alignment with the minute hand when you’ve departed, or descended, with the bezel markings indicating elapsed time. The Bezel and its mechanism are constructed the same way as watches costing thousands of dollars; we just wouldn’t have it any other way. We’ve used a deep black, anodized aluminum dive timing bezel insert for high legibility and superior durability. Some companies use sapphire or ceramic, however, they are susceptible to shattering upon impact, and who wants their bezel shattering when you’re 50 feet deep? The red triangle pip at 12 matches the minute hand, and the C3 Super-LumiNova pip keeps it visible underwater, so you know just when you started that dive, or the trip to the mall.